Within social psychology the concept of self-segregation has been known for a long time (read more). This concept refers to the process of people forming groups with other like-minded people around a set of ideas or beliefs and distance themselves from contrary ideas. In these groups these ideas and beliefs are not only constantly shared but also amplified. The latter is made possible by the lack of correcting and moderating influences within these groups. If they are there, they are generally quickly silenced. This type of processes has existed for as long as we can remember. People have always formed groups around religious and ideological ideas. The existence of these groups can lead to radicalization of its members. Within the group we keep on hearing the same ideas and we hardly ever hear them criticized. Whomever disagrees does not really belong to the group. With the rise of social media it has become easier than ever to form these groups of like-minded people. These types of groups on social media are called echo chambers. On Facebook we have the tendency to seek information which confirms our views and people who agree with us. This way echo chambers evolve, for example pro-Trump and anti-Trump echo chambers. Within our own echo chamber we gradually start to believe that most sensible people agree with us. If, suddenly, we see someone with radically opposing views we might respond emotionally: "What is this idiot saying? Is he really pro-Trump?" 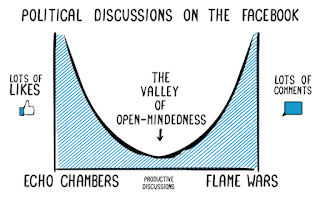 The existence of echo chambers can lead to strong negative emotions, both within the echo chamber in which we constantly reaffirm how idiotic the other party is and outside of the echo chamber when members of different echo chambers suddenly meet and when they feel like they're facing the 'enemy'. Echo chambers fulfill our need to be affirmed in our feeling of being right but we may have to pay a high price for them. How can we prevent ever growing polarization? I think that becoming aware of what echo chambers are and how they can be harmful can be a good first step. 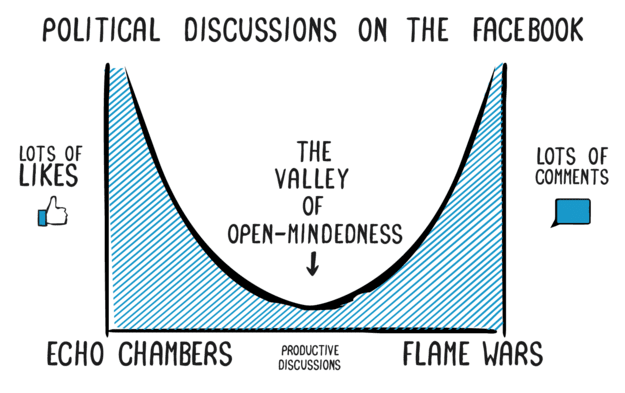 Once we know this we can consciously try to develop a certain openness to people who think fundamentally different. This requires us to not be too afraid of examining other people's views and argumentation and of discovering that our own views may not be fully defensible. Also, it requires that we examine our own views and argumentation carefully and try to clarify them in a way that will not directly threaten or offend other people. This may be much harder than it sounds because we are automatically inclined to seek the company of like-minded people and avoid other-minded people. Staying in contact with the latter requires effort and self-control. We'd better realize that this effort is worthwhile considering the dangers of echo chambers. By definition, tolerance implies putting up with something you don't like. Therefore to claim one is tolerant of others views, yet render everyone who disagrees with you as stupid is a contradiction in terms. It is a massive opportunity to upgrade your world view, and enhance your consciousness to listen to those you don't agree with.